Tris(2-phenylpyridine)iridium(III), Ir(ppy)3, is used widely in organic light-emitting diodes (OLEDs) due to its high quantum yields and thermal stability. Utilising all of its singlet and triplet excitons for the emission, this green light emitting Ir(ppy)3 exhibits a very bright phosphorescence with an internal quantum yield of almost 100% [1, 2, 3]. It is one of the most successful green-triplet emitters in the rapidly developing field of OLED display technology. 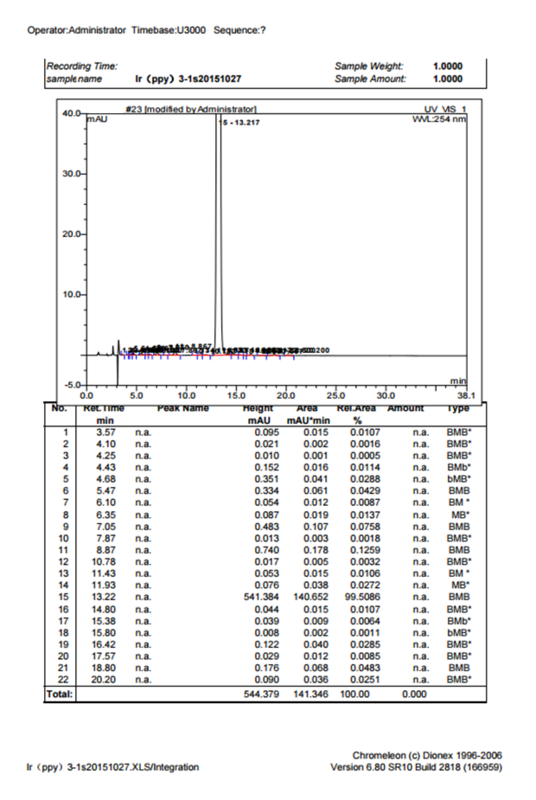 Absorption and emission spectroscopic characterization of Ir(ppy)3, W. Holzer et al., Chem. Phys., 308(1-2), 93-102 (2005), doi:10.1016/j.chemphys.2004.07.051. The Triplet State of fac-Ir(ppy)3, T. Hofbeck et al., Inorg. Chem., 49 (20), 9290–9299 (2010), DOI: 10.1021/ic100872w. High-efficiency fluorescent organic light-emitting devices using a phosphorescent sensitizer, M. A. Baldo et al., Nature 403, 750-753 (2000) | doi:10.1038/35001541. Efficient electrophosphorescence using a doped ambipolar conductive molecular organic thin film, C. Adachi et aL., Org. Electronics, 2(1), 37-43 (2001), doi:10.1016/S1566-1199(01)00010-6. Very high-efficiency green organic light-emitting devices based on electrophosphorescence, M. A. Baldo et al., Appl. Phys. Lett. 75, 4 (1999); http://dx.doi.org/10.1063/1.124258. Efficient blue-emitting electrophosphorescent organic light-emitting diodes using 2-(3,5-di(carbazol-9-yl)-phenyl)-5-phenyl-1,3,4-oxadiazole as an ambipolar host, Y. Zhang et al., RSC Adv., 3, 23514 (2013). DOI: 10.1039/c3ra43720e. Simplified phosphorescent organic light-emitting devices using heavy doping with an Ir complex as an emitter, Y. Miao et al., RSC Adv., 5, 4261 (2015). DOI: 10.1039/c4ra13308k. Management of singlet and triplet excitons for efficient white organic light-emitting devices, Y. Sun, et al, Nature 440, 908-912 (2006), doi:10.1038/nature04645. Novel organic electron injection layer for efficient and stable organic light emitting diodes, R. Grover et al., J. Luminescence, 146, 53–56 (2014). http://dx.doi.org/10.1016/j.jlumin.2013.09.004. Upconverted Emission from Pyrene and Di-tert-butylpyrene Using Ir(ppy)3 as Triplet Sensitizer, W. Zhao et al., Phys. Chem. A, 110 (40), 11440–11445 (2006), DOI: 10.1021/jp064261s. High-efficiency organic electrophosphorescent devices with tri(2-phenylpyridine)iridium doped into electron-transporting materials, C. Adachi et al., Appl. Phys. Lett., 77 (6), 904-906 (2000). High-efficiency and low-voltage p‐i‐n electrophosphorescent organic light-emitting diodes with double-emission layers, G. He et al., Appl. Phys. Lett. 85, 3911 (2004); http://dx.doi.org/10.1063/1.1812378.